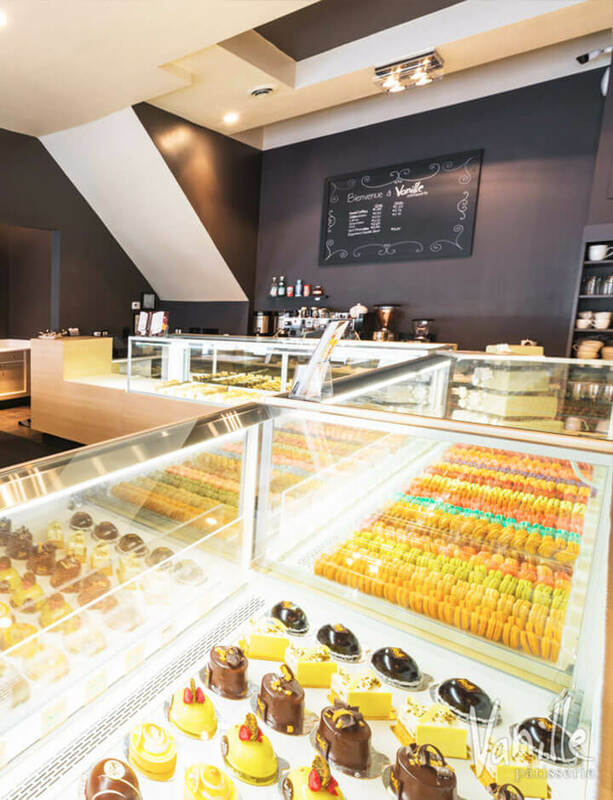 Initially founded in 2002, Vanille Patisserie specializes in authentic French pastries, desserts, and cakes. Owned and operated by chef Sophie Evanoff, Vanille is noted for its premier quality, taste, and dedication to its craft. Staffed with a team of classically trained pastry chefs, Vanille Patisserie offers its entire line of artisanal desserts and pastries, including delicious entremets (mousse cakes), luscious tarts, handmade chocolates and candies, the ever-popular French Macarons and freshly baked croissants in its Patisseries (French Pastry) shops and through the finest retailers. Packaged in design as elegant as the French pastries nestled inside, a gift from Vanille is an instantly recognizable statement of premier quality and good taste. We also offer our our highly acclaimed French-style macarons, as well as an exquisite collection of our carefully crafted handmade chocolates and French candies through the online boutique and design custom wedding cakes, favors and other cakes and dessert creations through our experienced team of sales consultants.